Veterans Affairs may soon find it easier to hire and fire employees, with the House passing two bills this week attempting to streamline the department's archaic personnel rules. Along largely partisan lines, the House approved the contentious VA Accountability First Act on Thursday evening. The bill would give the VA secretary expedited removal authority, meaning any employee fired by the secretary would be out of a job and off the department’s rolls that day. Any employee facing removal, suspension of at least 14 days or a demotion would receive advance notice of 10 days, and the secretary would have five days in which to rebut any response from the employee. Those employees would maintain appeal rights to the Merit Systems Protection Board and U.S. Court of Federal Claims. The Accountability First Act would also allow VA to reduce employees’ pensions if they are convicted of a felony that affected their job and to recoup bonuses and relocation expenses in some circumstances. Employees facing those penalties would also be entitled to an appeal. The bill passed 237-178, with just 10 Democrats voting in favor and three Republicans voting against. A similar bill cleared the House last year with 69 Democrats on board. In a significantly more bipartisan effort, the House on Friday unanimously approved by a 412-0 vote a bill aimed at improving recruiting and retention at VA medical facilities. The measure would enable the department to create a database of critical vacancies and to consider applicants for multiple positions. 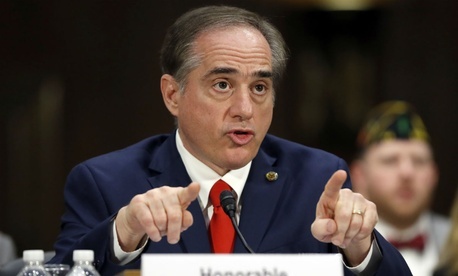 It would require VA’s political appointees to receive a performance review evaluating their recruiting and retention efforts, as well as their development of future leaders. The bill would create a promotional track for technical experts to advance and a fellowship program that allows employees to receive training from the private sector. The House approved a dozen amendments to the bill, including provisions to focus on rural VA hiring, allow VA to offer employment to individuals two years away from completing their residencies and give VA special hiring authority for the occupations with the largest staffing shortages. The White House has voiced its support for the accountability measure, according to committee aides. President Trump held a “listening session” with VA Secretary David Shulkin and an array of veterans organizations at the White House on Friday. Shulkin told Trump of the House action, saying he was “very, very grateful” for the legislation moving forward. A spokeswoman for Sen. Johnny Isakson, R-Ga., chairman of the Senate Veterans' Affairs Committee, said the senator is still “exploring options” for a bill that can pass the Senate. Sen. Marco Rubio, R-Fla., has introduced companion legislation for Roe’s House-backed measure. Isakson himself said he is committed to working with his House colleagues and Democrats on his committee to move accountability legislation forward. “I'm committed to moving legislation that gives Secretary Shulkin the tools to discipline bad employees,” Isakson said. “Accountability reform is a top priority.” The senator authored bipartisan legislation in the last Congress to expedite the firing process at VA, but it stalled in the Senate after clearing his committee.